Notes: PRR Class AS-18AM; Horseshoe Curve; Altoona, PA. 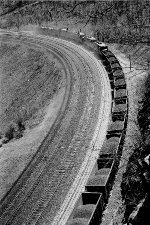 Description: Horseshoe Curve-1959. Here is an original photo that I took at the Pennsylvania Railroad's Horseshoe Curve near Altoona, Pennsylvania, on 03 September 1959. Shown here (R to L) are PRR engine #8665, one unit whose number is unknown, and engine #8668. All are AS-18AM's built by the American Locomotive Company in 1958 and rated at 1,800 horsepower each. They are pushing a westbound mixed-cargo freight train around the Horseshoe Curve and up the Allegheny Mountains to Gallitzin and points West. The N-5 Caboose is #477181. Description: Horseshoe Curve-1959. Here is an original photo that I took at the Pennsylvania Railroad's Horseshoe Curve near Altoona, Pennsylvania, on 03 September 1959. Shown here (R to L) are PRR engine #8668, one unit whose number is unknown, and engine #8665. All are AS-18AM's built by the American Locomotive Company in 1958 and rated at 1,800 horsepower each. They are pushing a westbound mixed-cargo freight train around the Horseshoe Curve and up the Allegheny Mountains to Gallitzin and points West. The N-5 Caboose is #477181. Description: 24th Street. Here is an original photo that I took of Pennsylvania Railroad locomotives in Altoona, Pennsylvania, on 10 January 1965. Shown here (R to L) are PRR engines #8668 and #8662. Both are AS-18AM's built by the American Locomotive Company in 1958 and rated at 1,800 horsepower each. They are returning to East Altoona to make another helper/pusher run up the Allegheny Mountains via the Horseshoe Curve to Gallitzin and back. This photo taken just West of the 24th Street Bridge. Description: Horseshoe Curve-1966. Here is an original photo that I took at the Pennsylvania Railroad's Horseshoe Curve near Altoona, Pennsylvania, during early May of 1966. Shown here are PRR engines #8663 and #8668. Both are AS-18AM's built by the American Locomotive Company in 1958 and rated at 1,600 horsepower each. They have just rounded the Horseshoe Curve, and are returning to East Altoona for yet another run up the Allegheny Mountains to Gallitzin and back. Description: Horseshoe Curve-1966. Here is an original telephoto view that I took at the Pennsylvania Railroad's Horseshoe Curve near Altoona, Pennsylvania, during May of 1966. Shown here (L to R) are PRR engines #8668, #8663, #2200, #2201, #2203, and #2202. #8668 and #8663 are both AS-18AM's built by the American Locomotive Company in 1958 and rated at 1,800 horsepower each. #2200, #2201, #2203, and #2202 are all EF-22's built by EMD in 1963 and rated at 2,250 horsepower each. They are pulling a westbound ore train. Note all of the G-39 "Ore Jennies"! Description: Horseshoe Curve-1966. Here is an original photo that I took at the Pennsylvania Railroad's Horseshoe Curve near Altoona, Pennsylvania, during early May of 1966. Shown here is PRR engine #8668, an AS-18AM built by the American Locomotive Company in 1958 and rated at 1,600 horsepower. 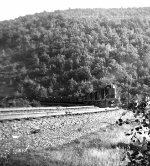 It is rounding the Horseshoe Curve at the head of a westbound ore train, but will uncouple at Gallitzin and return to East Altoona for yet another run up the Allegheny Mountains to Gallitzin and back. Description: Horseshoe Curve-1966. Here is an original telephoto view that I took at the Pennsylvania Railroad's Horseshoe Curve near Altoona, Pennsylvania, during early May of 1966. Shown here (L to R) are PRR engines #8668, #8663, #2200, #2201, #2203, and #2202. #8668 and #8663 are both AS-18AM's built by the American Locomotive Company in 1958 and rated at 1,800 horsepower each. #2200, #2201, #2203, and #2202 are all EF-22's built by EMD in 1963 and rated at 2,250 horsepower each. They are pulling a westbound ore train. Note all of the G-39 "Ore Jennies"!